I have the last of the Pure Ice Fairytale Forest polishes to share with you today. This was collection that was released early in December. The collection was limited edition, but there could be a few stragglers hanging out in a Pure Ice display. I adored this collection. I thought it was unique for a drugstore price collection especially in a time when drugstore/mainstream polish is waning in appeal. This color however, I think was a dud in the collection and I'm peeved at how they made this one! Fairytale Forest is a steely frosty blue shimmer. Color: I can't. I can't. I can't. If you recall from my other reviews of this collection (Tales Untold, Precious Jewel, and True Love's Kiss), these were pastel cremes with beautiful glass fleck golden shimmer. Well, that beautiful glass fleck golden shimmer is in this color too. You just can't see it because instead of a creme polish they paired it with this frosty shimmer blue crap. In person, you can see that gold shimmer in the bottle, but on the nail it's completely covered up by this atrocious blue frost of sadness. The color isn't bad, but it doesn't fit the collection and it's just not a nice finish much less a modern finish. Formula: The formula applies nicely. I used 2 coats here. Price: This was $1.99 at Walmart. I can't fault the price. Overall: Why?!?!? I almost feel like I can't fault it because everything else in the collection was great. It was a unique collection at $1.99 a pop. This color just doesn't make sense and I don't know why they thought this would look nice? Why bother putting that same shimmer in this color but use a frost? 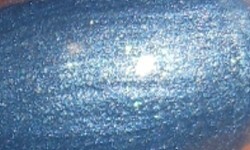 Frost polishes do not pair well with glitter or shimmer. The frost will always overpower those elements. It's stupid a amateur nail polish mistake that I'm clearly overly upset about. I'll get over it, but come on now. No more frost polishes of sadness please.